To put it simply; I love Eleminis. I’ll go into detail later but let me just gush a moment. It is easy to play, simple to teach, and so very magical, especially for kids. This card game has made itself so incredibly accessible that every age I played with had an extremely positive response. Often they wanted to play again and again. Is this game for everyone right out of the box? No, but it could be, if you’re inventive enough. So, let’s find out what makes this game so great. The goal of the game is to collect one of each of the five elements and place it in front of you: Fire, Rock, Water, Air, and Plant. Eleminis keeps it simple. Draw a card and play it. The card itself will tell you all the things you can do with it. 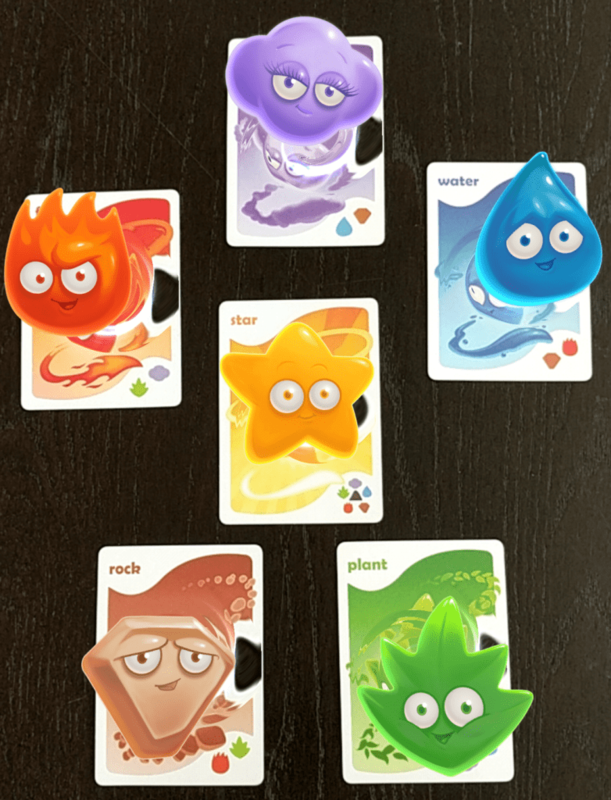 Each player has five spaces in front of them where cards can be placed. 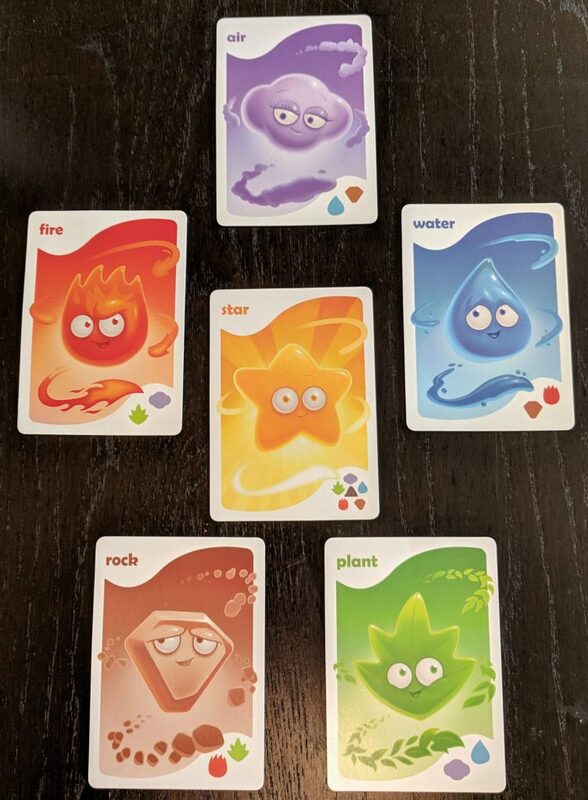 It’s a strategic game of Rock, Paper, Scissors, where Fire burns Plant and Air, Plant swallows Air and Water, Air blows away Water and Rock, Water washes Rock and Fire, and Rock crushes Fire and Plant. The cards are cute miniature elements (‘Eleminis’) and they have multiple ways they may be played. They can go into any empty space or you can use them to destroy a weaker Elemini. This is where the strategy really shines. Do you give someone a duplicate Elemini, making it harder to replace? Do you keep the Elemini for yourself? Or do you replace someone’s weaker Elemini that they desperately need? The more players the more intense the competition. Things really get spicy when you draw special cards. Star cards are wild and can replace any other card but are not easy to move or steal. This can only be done by using Action cards. Action cards let you do drastic things like Swap, Move, or Discard Eleminis. My favorite is the Recycle Action card: discard any Elemini and take another turn! The last special card in the base game is the Trash card. This can be the bane of anyone at the table. Place it in an opponent’s empty slot or use it to replace one of their Eleminis. They can’t win with the Trash card and, if you’re keeping score, it’s worth negative points. Look at those adorable Eleminis! The design is bold and bright, which is easy on the eyes and makes the game pop at the table. They have attitude and emotion which is endearing and exciting. When you play that Fire card it’s easy to really imagine it burning up that wimpy Plant. But then the meek looking Water comes along to wash away the mighty Fire! The contrasting colors really bring to life the characters. The cards are easy to read and understand. 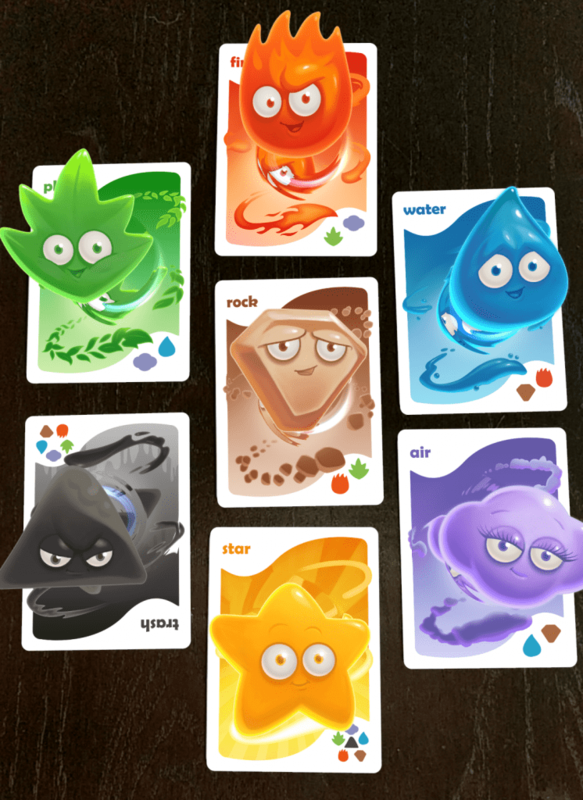 On the bottom of each card are the symbols of the Elements that it can affect. It makes play move fast and cuts down on rulebook checking. The rules are super easy to understand. Just a few pages of instructions with several examples and you’re ready to play. The game comes in a very attractive box that is easy to stow and carry. The box has filler to hold the cards in place which leads me to think they should have gone for a smaller container to match the size of the cards. It’s made of sturdy cardboard so it protects the cards and booklet well. The cards are also made of high quality material that have endured multiple sessions with my daughters at home and restaurants. Outside the slight bend that occurs from harsh treatment they have withstood the beatings. If you can’t get enough of the Eleminis, I have good news: there’s an expansion pack. It includes a Super Star, Spirits, and a Heart. These cards really shake things up. The Super Star can’t be moved by anything and is worth a lot of points if you’re keeping score. The Heart is a unique twist on the Eleminis. You play the Heart in any open space. However, if you start your turn with a Heart in front of you, take your turn like normal and if at the end you have four different Eleminis and the Heart, you win! But if you don’t then you must pass the Heart to an open space of another player. Spirits are a mystery. They all look the same until you look at them through the app and find out what Elemini they really are! Then, they function just like that Elemini would. Yes, an app. 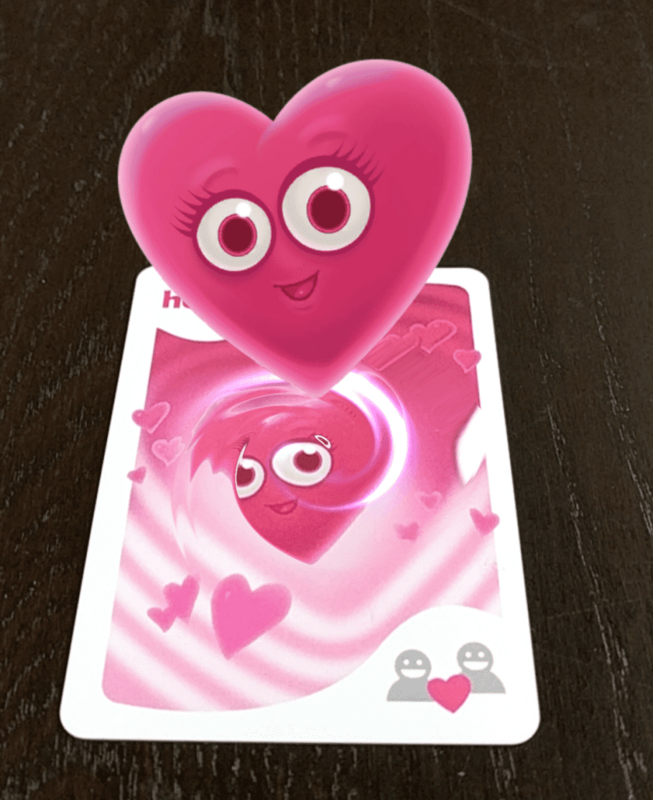 Eleminis has a free AR app that allows you to look at your Eleminis through your phone screen and see them pop to life. It has fun little sound effects each time an Elemini comes up on screen. They don’t do anything particularly amazing but the Elemini is slightly animated and has some sound to go along with it. The app really shines when you scan multiple Eleminis or when you’re figuring out what Spirit Elemini you have. As I said at the beginning of this review I really like Eleminis. If you’ve read any of my other reviews you know that I enjoy a myriad of games. I also have two daughters who are interested in my hobby and I want to provide many ways for us to enjoy it together. This is one of them. Perhaps that’s why I’m such a fan, because my girls love the game. But I think that’s okay! Playing Eleminis brings them joy and laughter. They drain the battery on my phone watching all the Eleminis come to life. They encourage and help each other make decisions on where to play the Eleminis and other cards (usually against me). Eleminis is a deceptively simple game that easily teaches strategy and encourages players to think through all possible options. It’s a great thinking game but plays so quickly it’s not a drag. There are rules for scoring and for team play. Another thing that’s fantastic about this simple game is that the basic rules are there for you to expand on. Feel free to create your own set of custom rules. Want to change up how you play? Do it! Collect 5 of one element. Hold 3 cards in your hand, play one. You can make the game play however you want. It can become a much more involved and strategic game if you take the time to develop it. The app is such a fun addition to the game. While we sit around our family table we take turns passing the phone around to enjoy the art and character of the Eleminis. 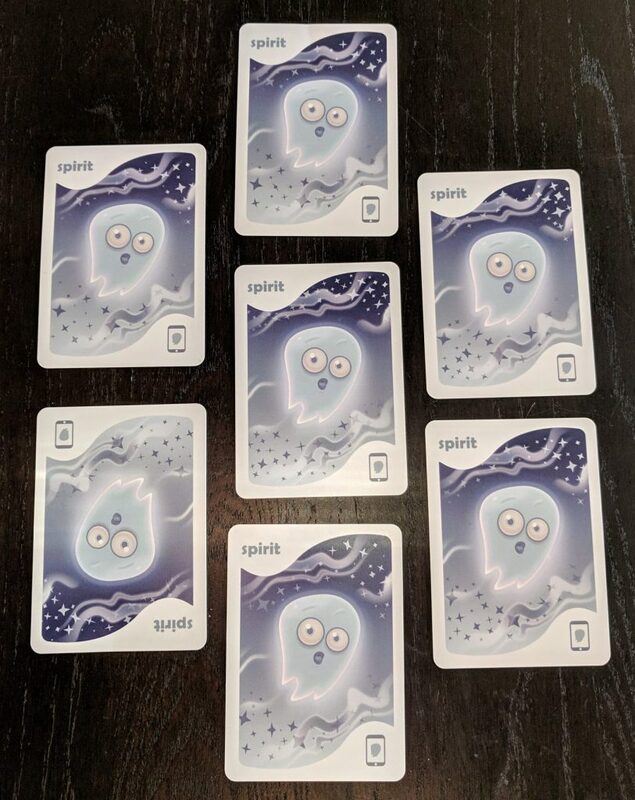 No, it doesn’t really add anything to game play, outside of the Spirit cards, but the kids I’ve played with really enjoy it. The app is responsive and looks great on a bright screen. But when you take a picture the only option is to share it. I’d like to save the pictures automatically to my camera roll. I would have liked to see the design on the cards include the weak elements on the top and bottom. This way if you were to play a game with cards in hand they would be easier to see. I believe the earlier editions several years ago included this. Also, there are a lot of stars. There are eleven of each Elemini and Stars. If you include the Super Star, the total comes to twelve. For such a powerful card there are too many of them. Often a player would end up with two or three Stars. This is easily remedied by removing some from the deck, so it’s really not a big deal. The last thing is the Spirits. These are such a fun idea and so exciting and attractive to a younger audience and it really capitalizes on the app. However, when playing with adults, unless you love the AR aspect and everyone has their own phone, I’d remove the Spirits. It slows the game down and is just a bit tedious for a game that can play so quickly. Eleminis is extremely easy to get on the table. My four and six year olds love it. The girls were able to teach it to their cousins and friends. This is a game that can grow and become more challenging by adding simple house rules. The Eleminis come alive both on the cards and in the app. Flying Meeple told me they have delayed a Kickstarter to mass produce the game but haven’t given a date yet. The price point is so accessible at $15 on Amazon and stock is running out, why not add it to your shelf? Next postLife Siphon Review – It’s good to be bad! Jonathan has spent over 15 years in the ministry serving families with youth and children. During this time he found and developed a love for gaming. He enjoys all sorts of board games and RPG games. The social aspect is his favorite part of gaming. Jonathan really enjoys teaching games and introducing people to new games and the hobby in general. He's trying his best to raise his two young daughters in the love of gaming, too.